The chattering strand of fourth and fifth graders snaked out of the bright yellow school bus, hustled through a gap in the cyclone fence and filed into the open door of Dow's Prairie Elementary School. "Drop your backpacks and go straight to the library," their teacher instructed. "We're gonna go watch the inauguration." 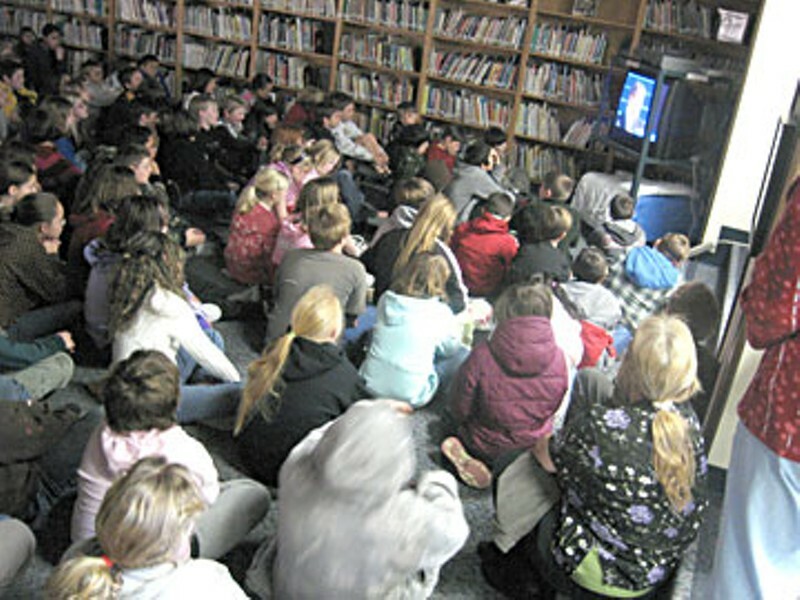 A concentric mass of cross-legged students covered the carpeted floor of the modular library building, their faces illuminated by a glowing TV screen perched in a corner on a rolling metal cart. Teachers, aides and more students sat along the periphery in molded plastic chairs on metal legs. Late-arriving students had to squeeze their way into the huddle or sit on the steps leading down to the sunken library floor. With the overhead lights turned off, all eyes were turned toward the image of Hilary Clinton addressing the cheering throng in Washington, D.C. The students applauded along with the live crowd at the National Mall when the incoming Secretary of State wrapped up her comments. They applauded again at Pastor Rick Warren's mention of "the inauguration of our first African-American president of the United States." In fact, every time applause broke out in Washington, the students on the floor of the McKinleyville school library responded in kind. They grew a bit fidgety during Aretha Franklin's rendition of "My Country 'Tis of Thee" but perked back up once Barack Obama took the stage. When Chief Justice John Roberts mixed up the order of the presidential oath of office, causing Obama to stumble a bit, the students giggled. But they sat quiet and attentive as Obama spoke of "gathering clouds and raging storms" in our national climate. Several girls played with their hair clips and one boy held a Nerf football in his lap as the new president announced that, "Starting today, we must pick ourselves up, dust ourselves off, and begin again the work of remaking America." A boy in a camo hoodie rested his chin on his knee and squinted at the screen as Obama declared, "Our health care is too costly, our schools fail too many, and each day brings further evidence that the ways we use energy strengthen our adversaries and threaten our planet." As the speech wore on, the floor-full of students grew a bit restless, their heads lolling and swiveling in search of something more exciting. They seemed to sense the end approaching and turned to the screen in unison as Obama reached a crescendo. "Let it be said by our children's children that when we were tested we refused to let this journey end, that we did not turn back nor did we falter; and with eyes fixed on the horizon and God's grace upon us, we carried forth that great gift of freedom and delivered it safely to future generations." Out on the playground afterwards, a few girls scampered eagerly over to a wall near the U.S. map painted in primary colors on the asphalt. Other kids ran laughing and yelling to the swings, bars and slides nestled into wood-chip rectangles. When a nosy reporter asked a few of them what they thought of the inauguration, they started talking all over each other with hyper competitiveness. "I was thinking that -- ooh! ooh! -- that he was making history," said nine-year-old Christian McKee. "Yeah," agreed Logan Wells, a composed boy of 11. "We usually have to read it in books". And then the debate broke out. Garrett Hensen, a tough-looking kid in a McKinleyville Panthers football jersey, approached the crowd and announced defiantly, "I'm John McCain all the way." "You actually like McCain?" Christian asked, incredulous. "Heck yeah," Garrett said. Then, as if to explain, he added, "We live in a hick town." "I think it's pretty cool that we have an African American president," offered Edin Berns, 10. Garrett countered with, "He's too young." "You don't know what you're talking about," Logan said. As other kids began to lose interest in the conversation, Logan offered his somber appraisal of the day's significance. "I really think Obama's gonna help our economy," he said. When asked why, he explained, "He's just a really nice person, and he's trustworthy so I know he'll do a good job at it." "And," chimed in Hunter Calvert, 11, "he's been talking about things like making electric cars and stuff." With that they scattered across the playground, bounding and yelling happily in the January sun.